From time to time I am in the mood for a good ol' page turner! A good whodunit; Something that makes me forget about working, sleeping or eating because all I want to do is READ. 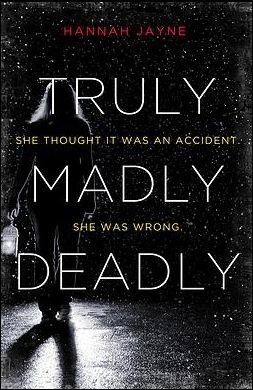 Truly, Madly, Deadly was one heck of a book! A climatic roller coaster! Want a book that has it all? A strong main character, a superb secondary character cast, an "oh my god, I can't put this down!" kinda book? Well than this is the book for you! Be warned though, you will be up until the wee hours finishing this one. I dare you to try and put it down...Double dare you! I thought I had it all figured out. I thought I nailed the perpetrator from the very beginning, but man was I fooled! Making a very audible gasp that caused a reaction from my sleeping Fiance and 2 dogs. What a wildly suspenseful, nail biting ride! Okay, that is enough raving. Let me try to break it down for you. Hannah Jayne does an amazing job when it comes to the character development, and story building. We learn immediately(from the summary) that Kevin dies. And at first, it sparks a bit of sadness, but you can't help but feel some relief for Sawyer knowing that she is finally free from an abusive relationship. Then she gets the eerie note "Your welcome"... Let the games begin! it doesn't take long for the story to erupt. I loved how the author delivered each character as a potential suspect. You never truly know until the very end. Hannah Jayne's writing style was simple, yet kept you pulled in the entire time. I loved Chloe's character, she added some great comedic relief at times with her light, airy humour. And the little hint of romance was a perfect touch. It added a nice break from all the intensity. A healthy balance of all the elements; Murder, mystery and romance. Truly, Madly, Deadly will give you everything you are craving for a summer read and so much more! So glad to see your review-I saw quite a few middling reviews that dampened my excitement but I still really want to check it out!